The North American premiere of Warren Adler’s tour de force black comedy The War of the Roses opens the Delaware Theatre Company (DTC’s) 2016-17 season. This devilishly witty play exposes the dark side of divorce and invites the audience to savor in its mayhem. Christina DeCicco & Jake Noseworthy play the doomed couple. 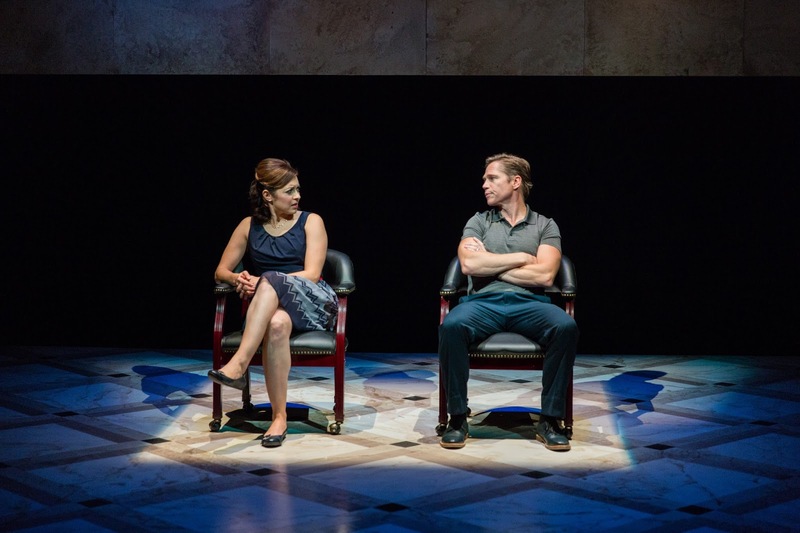 The story is mostly told through flashbacks while the couple – Jonathan Rose, a high-powered Washington, DC lobbyist and his “arm candy” wife Barbara – are meeting with their lawyers to discuss divorce. The play takes the audience on a journey from their first encounter as naïve, idealistic 20-somethings at an auction to the deconstruction of their 18-year marriage in their lavish home. Over the past 18 years, Jonathan has become successful in the DC political scene, while Barbara (who quit college to marry the then-struggling law student) has accompanied her husband to countless business dinners and parties, while raising their two children. She completed decorating their grand home with fine furniture and art and now she’s ready for a new project – making and selling her gourmet pâté. Jonathan is not interested in supporting his wife’s new venture; instead, he wants her to remain the perfect wife and mother. Unhappy with his lack of support, Barbara begins to fall out of love and eventually wants a divorce. Since Barbara worked years creating the perfect home, she feels that Jonathan should be the one to leave…but Jonathan has no plans to move. To try and rectify the problem, Jonathan and Barbara are instructed by their lawyers to annoy the other one to the point that one of them will leave. The couple goes beyond annoying each other and begins a battle royal when their children leave for camp, escalating into a full-fledged war of will and wit. Director Bud Martin has a keen ability to execute dark, menacing scenes while finding the humor in them. Thankfully, he has a stellar cast ready to tackle the physical and emotional challenges this piece demands. 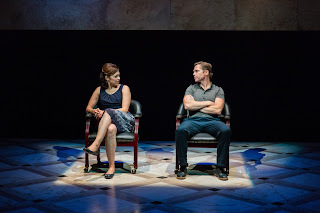 Jack Noseworthy and Christina DeCicco are spectacular as Jonathan and Barbara. They are tasked with making their characters likeable while demonstrating appalling behaviors, a feat not easily done. These seasoned actors understand the importance of fully developing their characters so the audience connects with them and finds humor in their despicable actions. Lenny Wolpe as Jonathan’s lawyer, Goldstein, and Cameron Folmar, as Barbara’s lawyer, Thurmont, are also delightful. Mr. Wolpe, a rabbi-turned-lawyer, provides Jewish proverbs to help guide Jonathan through the divorce, while the waspy Thurmont seems to get bored with Barbara’s antics, focusing more on sporting activities while meeting with her. The rest of the ensemble cast including Adam Altman, Eric Kramer, Brian McCann, Kerry Kristine McElrone, and Karen Peakes are hysterical as members of the DC elite during an explosive dinner party scene. As with most recent DTC productions, the set is an important character. Designer Paul Tate DePOO III has meticulously created the Rose’s magnificent two-story home from the fine furnishings to the gigantic crystal chandelier that plays an important part in the outcome of the war. Unfortunately, the gorgeous set is destroyed by the end of the play – much like the characters’ marriage. The War of the Roses is the perfect guilty pleasure. Don’t miss it before it closes on October 2nd. For tickets and additional information, visit www.delawaretheatre.org.